The Prefecture of Florina lies in the northwestern corner of Macedonia and is characterized by its continuously alternating landscapes. Four mountains and six lakes contribute to form this magical environment. It stretches to 1924 square kilometers (743 square miles), with an average altitude of 650 meters (1950 feet) and a continental dry climate. Beech, oak, chestnut, and birch trees cover the slopes of Mt. Verno, Mt. Varnounda, Mt. Triclario, and Mt. Voras; this is the southernmost part in Europe where you can see birch trees growing. Besides the dense beech and oak forests, there exists in Florina the only cedar (pseudocypress) forest in Europe. Farming, animal husbandry, fishing and, lately, tourism form the basis of the local economy. Lignite (brown coal), bauxite, yellow cake, marble, granite, aragonite, and mineral water are treasures hidden in the subsoil of the Prefecture. Despite all of these treasures, Florina was practically unknown to the general public, mainly for historical reasons. Wars, conquerors, slavery and, of course, the postwar Greek Civil War that had a much graver impact to this specific region, bordering on the then socialist Albania and Yugoslavia. The people became refugees in their own and other countries. Going around the mountainous landscapes, you’ll find a number of abandoned or nearly abandoned villages with nature claiming them back. Hydro-biotopes existing in Florina Prefecture are mainly natural or even artificial , consisting of marsh or soft water areas with a high degree of biodiversity. Most important in this aspect are the six lakes of the Prefecture: The two Prespes Lakes (Megali Prespa and Mikri Prespa), and Vegoritida, Chemaditida, Zazari and Petron Lakes. For a closer look to the ecology of the Lakes please click here. By visiting the Prespes Lakes, you’ll have the chance to get acquainted with a different face of Greece, though tourism has begun to take its first, albeit cautious, steps in the region. During every season the Lakes offer a different magical landscape. The Lakes have been declared a National Park and a place of Special Natural Beauty. The visitor can view some 260 of the 380 bird species living in Greece. Prespes Lakes and their islets are definitely a must see. 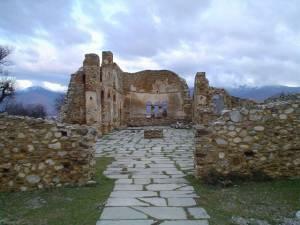 The Byzantine monuments in the Prespes Lakes come as a complement to the beauty of the region. On St. Achillios islet, permanently connected to the coast by a floatable bridge, five Byzantine churches are preserved as well as sculptures of the Hellenistic and Roman Times. On the southern coast of Megali Prespa, ascetic hermitages and icon frescoes are preserved on rocks (13th-14th centuries).